That last one, recommended by one of you with reserve, is actually published in at least 38 hymnals. Its simplicity mirrors the simplicity of our calling as Christians. Let it shine! Loudest praise. Joyful noises. Making music in our hearts to the Lord. Worship tunes. The Book of Psalms. Historic Hymns. Scriptural Chants. We have a wealth of ways to lift our voices in adoration to the Lord who loves us. How? In whatever way we are inclined. Why? Because all that is within us is meant to bless his holy name! Was your favorite song of worship included in this blog series? I hope so! If not, tell me about it in the comments box. I’d love to read the ones I missed! Those twelve words, now nearly 300 years old, still answer the question of what to do with fear and sadness. Cry out to Jesus! He is always the answer. I asked my Facebook friends to list their favorite hymns. They chose works by Charles Wesley more often than hymns by any other author. (No surprise, perhaps, since he wrote over 6000 pieces!) Let me share a few more lines from his works. “My chains fell off, my heart was free. I rose, went forth, and followed thee.” Those words from “And Can It Be That I Should Gain” are a wonderful description of conversion. “My name is written on His hands.” In “Arise, My Soul Arise” Wesley reminds us of one of life’s greatest comforts. While Charles Wesley did not write “When I Survey the Wondrous Cross”—it was penned by Isaac Watts—he is credited with giving it this high compliment: “I would give up all my other hymns to have written this one.” That’s high praise from such a prolific songwriter. Here’s just a snippet from Watts’ beautiful piece. My soul, my life, my all—are we giving that? The quotes from those four hymns are plenty to think about for this week. If time allows, please let me know how they change the way you go about this day. To God be the glory! Many thanks to cyberhymnal.org for providing the backstory information in this blog series. You can listen to Christ Tomlin’s version here. And there you have it. 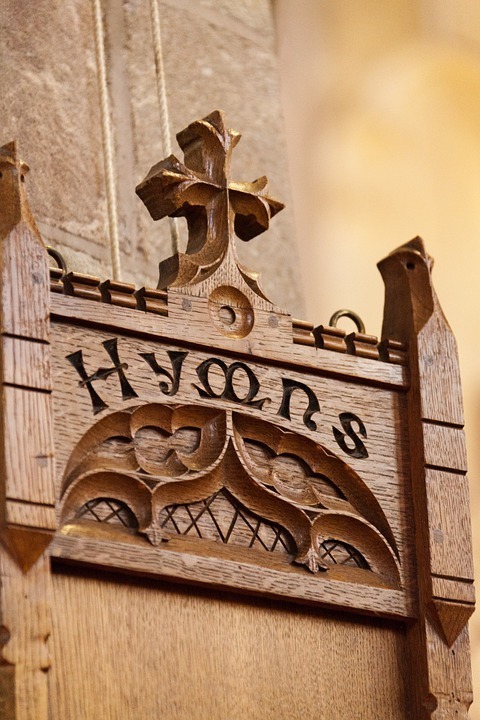 Won’t you respond by posting a list of your favorite hymns? Welcome back to our virtual hymn sing. Are you as amazed as I continue to be at the wealth of music we all have at our fingertips? I hope you’ll have time this week to listen to these inspiring pieces. I think of Martin Luther as a theologian, but he was also a musician. Over three dozen hymns are attributed to him. The best known is A Mighty Fortress Is Our God, but today I’ll share with you the words found in his From Depths of Woe I Raise to Thee, based on Psalm 130. Language has changed over the years, so reading this one takes a bit of extra work. It’s worth it! From depths of woe I raise to Thee The voice of lamentation; Lord, turn a gracious ear to me And hear my supplication; If Thou iniquities dost mark, Our secret sins and misdeeds dark, O who shall stand before Thee? To wash away the crimson stain, Grace, grace alone availeth; Our works, alas! are all in vain; In much the best life faileth: No man can glory in Thy sight, All must alike confess Thy might, And live alone by mercy. Therefore my trust is in the Lord, And not in mine own merit; On Him my soul shall rest, His Word Upholds my fainting spirit: His promised mercy is my fort, My comfort, and my sweet support; I wait for it with patience. My dad was an insurance salesman for years. As a child, I thought Blessed Assurance was extolling his line of work. In reality, Fanny Crosby, blind from childhood, yet the author of more than 8000 hymns, was writing about our Lord and Savior. Her words are a great way to end this week’s virtual hymn sing. This is my story, this is my song, Praising my Savior, all the day long; This is my story, this is my song, Praising my Savior, all the day long. Perfect submission, all is at rest I in my Savior am happy and blest, Watching and waiting, looking above, Filled with His goodness, lost in His love. You’ll find Third Day’s version here.